We'll shortly be reordering the ‘services and information’ part on the GOV.UK homepage into A to Z order. This change is the first step in launching the new 'mainstream browse' that Mark blogged about last week. During user research, we saw that users were confused when moving from the current, unordered, homepage to the new browse and back again. Changing the GOV.UK homepage to A to Z order fixed the problem. We'll be keeping an eye on these browse changes and, as ever, will iterate accordingly. If you've any questions or comments please do post below. Just wondered if any testing had been done on the 'top to bottom' A to Z, rather than 'left to right'. I just looked at the screenshot, knowing that I was looking for an A to Z ordered list, but I naturally found myself reading it to left to right across the rows. Interesting decision. I agree with John, that this seemingly runs counter to the 'F-shape' reading pattern. However, being a responsive design, presumably it'll make more sense when displayed in a single column on a mobile screen. Will - did you find that the new ordering reduced users' ease in finding the more popular content/top tasks? e.g. I would've thought 'Working, jobs and pensions' would be more popular than 'Disabled people', for instance, but the former is nine links (or 13 links if reading left to right) lower than the latter. Hi both, thanks for posting. Right now we're going for 'top to bottom' A to Z as it matches the arrangement on mainstream browse. We're keeping an eye on this though as it may well be that left to right is better. Will you be altering the services and information link in the grey section at the bottom of the pages? The 'environment and countryside' option is missing from the footer section. Do people even use the links in the footer, I wonder? Hi Andrew, would you send us a ticket about this? Thanks. I don't have footer stats to hand, but we're planning to review it in the future. We'll post here before any work starts. Agree with this approach. 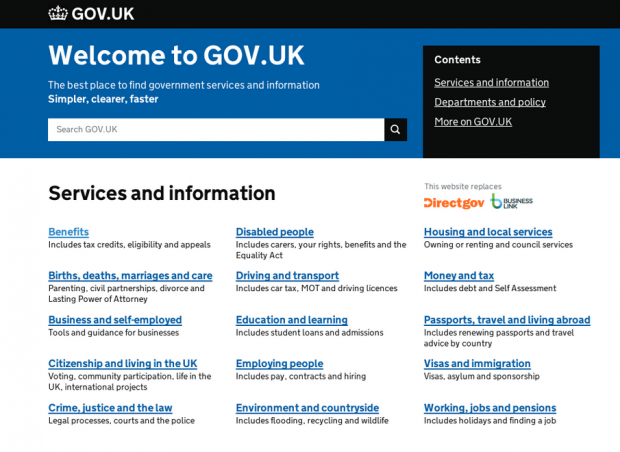 Following guidance and usability testing I did the same on Rochdale.gov.uk last Nov. Focused on speed and customer satisfaction; not just task completion. I'm also interested in the top to bottom vs. left to right. As a user, left to right always throws me. Did the responsive design have anything to do with the decision?